A Table Top Misting Fountain With Out Of This World Styling. Stuff Points: Earn 55 points when you buy this stuff. Out of Stock. No Longer Available. Because this model features styling that is reminiscent of a UFO or flying saucer, we call it the Cosmic Mist. It is a table top model mist fountain that features a new more energy efficient mister. This means that you will get all of the beneficial mist and lighting effects while using less electricity. It has a moderately sized glass bowl that sits atop a simple metal stand. Beautiful detailing around the edge of the bowl and on the splash guard adds to the appeal of this model, and thanks to the simple set up and smaller table top size, you can use this unit almost anywhere. Once you turn it on, the whole thing will appear to glow and change colors as the LED lights illuminate and cycle through the different lighting modes. A natural cloud of mist will be generated on top of the water, and will begin to fill the bowl. It looks like fog or smoke, but it is nothing more than natural water vapor. As the bowl fills, the mist will begin to gently float out and fly away. As it does this, it will humidify the air, remove contaminates due to the negative ions generated, and if you put a few drops of essential oil in the water, it will diffuse fragrance into the air too. This wonderful little water feature has a great look, and would make the perfect additional to any home or office location. A mist fountain is the perfect humidifier for a child's room, and the Cosmic Mist would make an ideal choice. Kids love to touch and grab at the mist as it billows out of the bowl, and parents appreciate the benefit that the increased humidity will have on their child's respiratory system. It can generate just as much moisture as regular style cool mist humidifiers, but it looks a whole lot more impressive so children love adding them to their rooms. These fountains are also great for tropical house plants. The added moisture is ideal for orchids and other flowers, and will ensure vigorous, healthy growth. You can also use one of these units to combat dry air created by running the furnace or central AC in your home. It will add just enough moisture to prevent dry throats and breathing problems, plus you get the decorative focal point to enhance your space. Essential oils can be calming and certain scents can heal or relieve stress. When just a few drops are placed in the misting bowl, this fountain will disperse the fragrance and benefits throughout the room quickly and effectively. This is a much healthier way to make your home or office smell good than using traditional deodorizers and sprays. This misting fountain has a slightly larger than average, 12" bowl size, so it will last a bit longer than other table models between fill ups. Because it is still fairly compact, and features a small footprint, it is an easy choice for almost any location you have in mind. The space aged styling of this model gives it a futuristic look, and both glass components feature elegant detailing to enhance the look. The metal stand is silver in color and has a simplistic design that does not take away from the amazing effects of this mister. Putting it together is easy and only involves a couple steps. There are no chemicals or additional parts and accessories needed, simply set it up and plug it in to start enjoying it. All you need to supply is regular old tap water to fill the bowl. A mesmerizing light show will accompany the fog that is generated, and it will refract through and illuminate the mist and glass pieces to create a spectacular looking decoration with added benefits. Soothing water noises will also accompany the mist production and light show to enhance your space and relax your mind. By utilizing electrical oscillation technology. Basically there is a little disc in the mist generating part that vibrates under high frequency. Evaporation takes place on the surface of this part to generate the fog or cloud that you see. As the mist is generated, it will fill the bowl, and then gently float away. If you add a couple of drops of essential oil to the water, it will diffuse the fragrance into the air via the mist production. WHAT IS THE MIST MADE OF? Pure water vapor. When the ceramic disc in the misting unit vibrates, it makes the mist, which is nothing more than a cloud of vapor. It will also generate negative ions along with the mist, and these will help to purify the air in your home or office. There are no chemicals or dry ice involved. Just simple tap water is all you need to enjoy the benefits of this unique misting fountain. Order Yours Today. 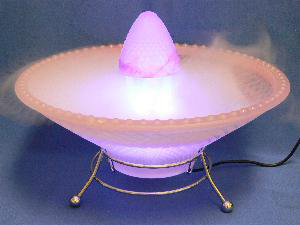 The Cosmic Mist - A table top misting fountain perfect for almost any space. A sculpted glass bowl fills with thick mist as the lights below add to the effect by causing it to change colors. Order Yours Today! Does the mist from the fountain cause damage to wood, fabrics or leather in the room? You run the same risk as you do with any room humidifier. You should not place it directly on anything that can get damaged by moisture, but other than that you will be fine. The mist will float out of the bowl, and it is made of water, just like a cloud. Much will absorb into the air, but some will settle on surfaces, especially those right next to, or underneath the unit.